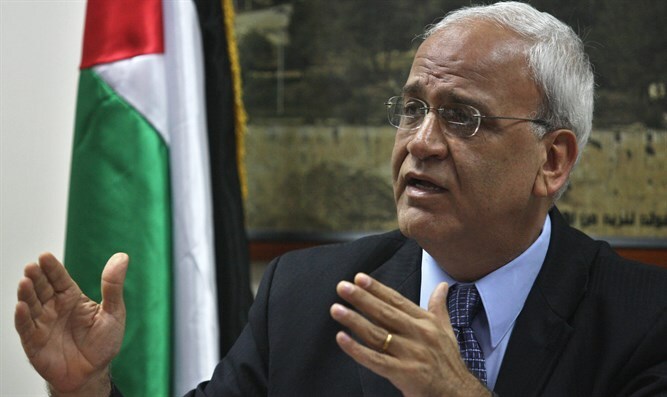 PLO Secretary General Saeb Erekat blasts Congress after it voted to condemn UN Security Council Resolution 2334. Palestine Liberation Organization (PLO) Secretary General Saeb Erekat blasted the U.S. Congress for overwhelmingly voting to condemn United Nations Security Council Resolution 2334, which condemned Israeli construction in Judea, Samaria and eastern Jerusalem. The bipartisan House measure passed last week by a majority of 342-80. It said that Resolution 2334 "undermines the prospect of Israelis and Palestinians resuming productive, direct negotiations" and "contributes to the politically motivated acts of boycott, divestment from, and sanctions against Israel and represents a concerted effort to extract concessions from Israel outside of direct negotiations." The statement further demands that the UN repeal or fundamentally alter the measure it passed. In a statement published on the PLO’s website, Erekat called Congress’s positions on the issue “unfortunate” and an affront to international law and the United Nations. "Rather than demand the U.S. administration oppose any resolution against the occupying state, members of Congress should have instead encouraged the next U.S. administration to adhere to established U.S. policy toward the illegitimacy of Israel's settlement enterprise and annexation of Jerusalem, including the most recent position by the Obama administration," he said. Erekat claimed that such positions run counter to international law and destroy the prospects for peace, bringing as an example a bill proposed by Jewish Home chairman Naftali Bennett that would see Israel annex Maaleh Adumim. "These attempts will only ignite violence and create an atmosphere that foments tensions, not only in Palestine but also in the Arab and Islamic world and globally,” he said. “What is needed now to achieve peace and stability in the region and the world is to implement international resolutions and end Israel's occupation, the root cause of violence and terror, and to recognize the State of Palestine on the 1967 borders with its capital in East Jerusalem." "All of this necessitates that we take responsibility by working effectively to confront these serious challenges, achieve domestic reconciliation, form a national unity government, convene the PLO National Council, and hold presidential and legislative elections,” he concluded. The passing of Resolution 2334 was one in a series of unilateral moves by the PA, which seeks to impose an agreement on Israel while bypassing direct talks. The PA has in recent years several times initiated similar resolutions at the UN Security Council, though they have failed to pass due to the U.S. using its veto power. This time, however, President Barack Obama chose to break with the longstanding policy and abstain in the vote, allowing the resolution to pass.